Oyotunji Village (The Village) was the first known black nationalist settlement developed by African American worshippers of the orishas (African deities). While the Village’s founders modeled Oyotunji on West African cultures, they also sought to build a self-defined, independent community in the United States within the context of the post-civil-rights-era black power movement. The Village was named after Oyo, a pre-colonial Yoruba kingdom lasting from the 1300s until the early 1800s in what is now southwestern Nigeria. Oyotunji’s name means “Oyo rises again.” Oyotunji was intended to follow the model of Yoruba villages in terms of layout, politics, and social relations while also incorporating some Fon traditions from the kingdom of Dahomey. Many of the Villagers’ religious practices centered on orisha worship. Various types of orisha worship spread from West Africa to the Americas during the trans-Atlantic trade, transforming during slavery and taking many forms across the Diaspora. Variations include Santeria, Lukumi, Vodun, and Candomble. Holdovers of traditional beliefs are also evident in the “Hoodoo” of the Village’s Gullah/Geeche low country neighbors. Part of the work done at Oyotunji involves uplifting the African-derived traditions of orisha worship in a form Villagers called Orisha-Vodun. Oyotunji represents a reshaping of African cultural and religious traditions while reflecting black nationalist trends. Black nationalist ideals ranged from racial consciousness and religious separatism to political independence and date back to the nineteenth century. Village residents enacted these tenets at Oyotunji by combining them with African-derived cultural and historical elements. The Village’s founder was born Walter Eugene King in 1928 in Detroit, Michigan. During the late 1950s, King was initiated to Santeria in Cuba. He observed that the Spanish slave masters’ Catholicism heavily influenced the secretive, exclusive Cuban religious customs. He also found that white practitioners, who dominated the practices, belittled African customs and excluded darker-skinned worshippers. After founding a house of worship and branding it Yoruba Temple, King changed his name to Oseijeman Adefunmi and sought an open space for worshipping black deities according to African traditions. This desire eventually led to the formation of an independent community aimed at further invigorating African culture and fostering self-determination among black Americans. 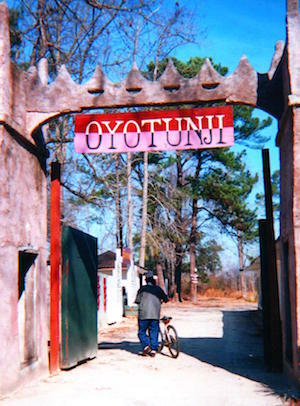 After several moves, Oyotunji opened in 1970 at its current location in Sheldon, South Carolina. The initial population of five (Adefunmi, wife Majile, and three children) increased to an estimated two hundred and fifty inhabitants within the decade. Adefunmi’s influence also grew as supporters crowned him oba (divine king) in 1972. High-ranking Yoruba spiritual leaders confirmed his status upon trips to Nigeria in 1981. Although hundreds and possibly thousands passed through Oyotunji, seeking spiritual services and training, the population has declined since the 1980s. In 2015 the Village had approximately thirty residents. After Oba Adefunmi I’s death in 2005, the Village has continued under the leadership of his son, Oba Adejuyigbe Adefunmi II who updated Oyotunji’s structure and goals. Focusing on sustainability projects, the Village serves as a retreat from the pressures of the wider society. Potential residents can buy land in Oyotunji. Short-term visitors can also visit the Village for spiritual consultations, festivals, and overnight lodging. Antionette B. Brown-Waithe, “Oyotunji Village: Making Africans in America” (master’s thesis, Georgia State University, 2012), http://scholarworks.gsu.edu/cgi/viewcontent.cgi?article=1067&context=anthro_theses; Kenja McCray, “Black Gods, Black Power: Life at Oyotunji Village, 1970-1990” (master’s thesis, Clark Atlanta University, 2002); “Oyotunji African Village,” accessed August 27, 2015, http://www.oyotunji.org/. African Village,” accessed August 27, 2015, http://www.oyotunji.org/.